So the kitchen/den wasn’t the only room we tackled this past week. 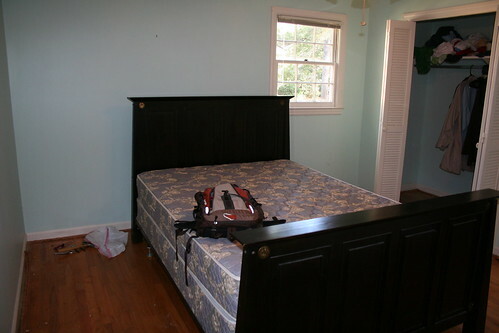 Nope, we also hit the master bedroom. The idea was that it would be nice to have a place to go to at night where there was no paint trays, no dropcloths, no boxes, no crap. And I can honestly say- it is very nice to have. I do still have staples and tack strips to remove in there but for the most part it is done for the time being. The day I moved up here I arrived at around 1:30 in the morning. The movers arrived 7 hours later. My sister 6 hours after that. So things were a little crazy that day. That is why I don’t have many “before” pictures of the rest of the house. 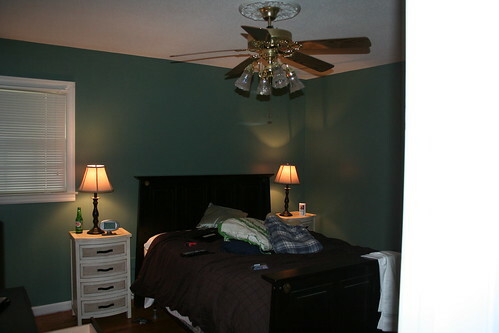 As a matter of fact I’ve only got this one lonely picture of the master bedroom. And it isn’t a true before picture because I had already ripped up the carpet when I took it. The carpet was my first act of remodeling. And it felt good. Well it felt good until the decades of dirt and carpet deodorizer hit my nasal cavity and sinuses. But that wasn’t anything that a little Claritin could solve. At first glance this pale blue might not look that bad- but believe me, it was. It was just gross. Definite need for a change. The color is Valspar’s Jekyll Sans Souci Green which is part of their historic landmarks collection. I didn’t put two and two together when I first picked it out, but it is actually from a hotel on Jekyll Island, GA which isn’t too horribly far from where I live. I went saining for shrimp there just last year. 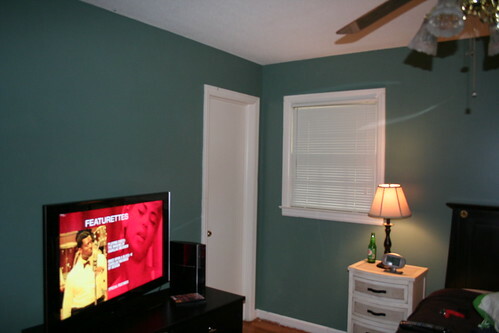 I need to at some point go back and put a second coat down- as evidenced by this picture. There’s the movie I was watching- Cadillac Records. Pretty good. So that’s the Master Bedroom! A nice place to relax after long days of painting and hauling carpet, and the various and sundry other things to do around the house. 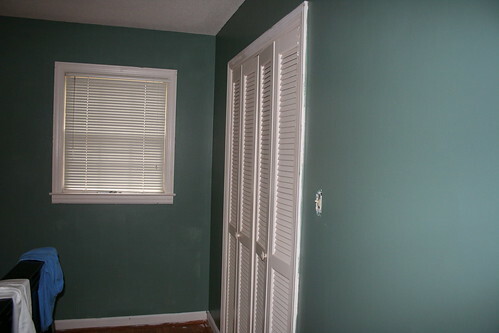 It will be even nicer with I get all the tack strips and staples up, put up the crown molding and quarter round (for the floor to cover up the little strip of discolored wood around the edge of the room) and of course the second coat of paint. But it serves it’s purpose for now. This entry was posted in Uncategorized and tagged DIY, Home remodel, Jekyll Sans Souci, Master bedroom, tack strips and staples and carpet Oh My!. Bookmark the permalink. Hi! I just saw you purchased a house! Did you take advantage of the $8,000 tax credit for buying a new house? We owed a bunch on our taxes too and just closed on a house. We filed an addendum to our taxes, took the credit and wound up getting $1,000 back! mention that I’ve really loved browsing your blog posts. In any case I will be subscribing in your feed and I am hoping you write again soon!